Temecula Valley is a destination alive with theater, public art, live music and art festivals. The creative culture of the Temecula Valley Southern California Wine Country is on display year-round. 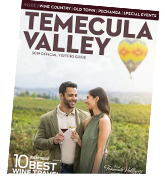 Live music is a given at most wineries in the summertime, and Old Town Temecula practically hums with performances all year, from theater to symphony, honky-tonk to rhythm and blues. Pechanga Resort & Casino boasts a performance space-and acts-second to none in our valley. Around town, too, works of public art and festivals celebrate the arts.